Recently, with my busy schedule, I have not had the time to do my usual nail art on my nails. There just isn’t time between schoolwork, extracurriculars, and work to take time out of my day for an artistic manicure. It’s disappointing, because there’s nothing I like more than having an intriguing design on my nails. I’m not the kind of person who likes to wear a “plain” manicure (though there’s absolutely nothing wrong with that!) 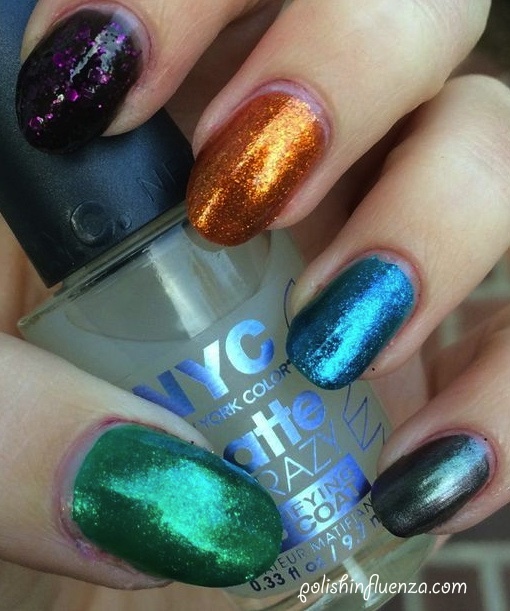 Fortunately, the new NYC In a New York City Special Effects Topcoats provide a quick and easy element of pizzazz to any manicure, in a flash! Today, I have two “effects” to show you: the Sparkle Topcoat, and the matte topcoat called Matte Me Crazy. Both come in 0.33 fl. oz. bottles, which should last for PLENTY of manicures. Each has a thin application brush for precision, which especially helps in the glitter placement of the Sparkle topcoat. I was so excited when these came in the mail, so let’s get to the review! Holy glitter Batman! I love this over all of these combos except over Hot Stuff. I think the base is just too coral-y for the cooler pink and blue to really stand out. Now, over Revlon Cotton Candy, this glitter is divine! I also love how the pink is played up over a blue polish base. I can’t wait to experiment with more color combos! Overall, the glitter requires minimal placement, if any at all, and looks great in one coat, though, the more coats you add, the more of a “punch” you’ll give your nails! Formula was nice, not too thick or thin. Love this! Um, wow. Just wow. I have no words. THIS IS FANTASTIC. Look how matte they all got! I love it over Love and Beauty Peacock because it really brings out the subtle purple duochrome of the polish (which my camera refused to pick up on, but I promise it’s there in real life). And please, do NOT get me started on how much I love Matte Me Crazy over Revlon Scandalous. It really emphasizes the pink hex glitters against the black jelly background. I really love every single one of these pairings! Formula-wise, Matte Me Crazy is pretty identical to Sparkle Topcoat, easy to apply, not too thick or thin, and super fast drying because of its matte nature. A real winner, easily beats Ulta as my favorite topcoat of all time. I’m in awe at both of these polishes. They seriously blew me away, and far exceeded my expectations of a drugstore brand. They’re worth every penny (and they don’t cost that many pennies, either!) Applause to NYC, you very well might have made me a matte lover. And that is not an easy task to do. 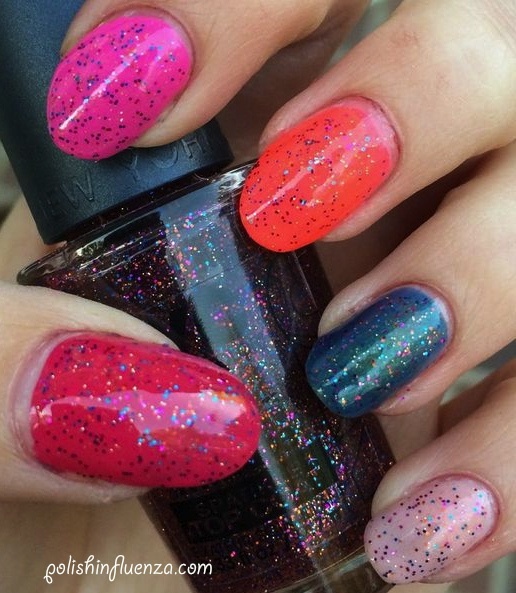 So what do you think of these two special effect polishes? Will they be making their way into your stash in the near future? 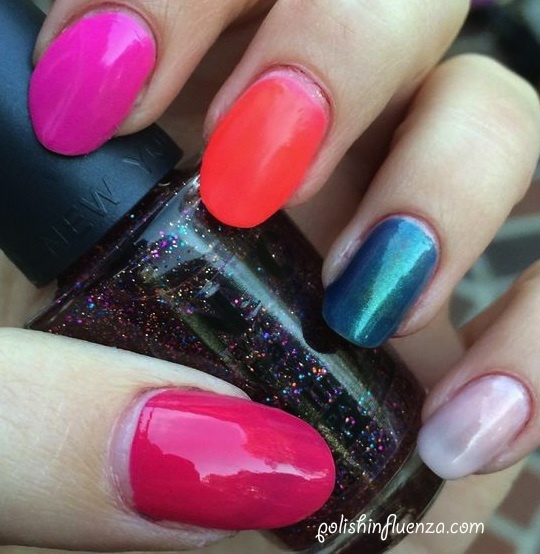 And are you a fan of nail art? Let me know in the comments! NYC polishes retail for $0.99-$1.99 a bottle, and can be found at drugstores, Target, and on their website, here. Product featured in this post was sent to me for review by a brand representative. For more information, please see my Disclosure Policy. Categories: New York Color, Reviews, Uncategorized | Tags: blue, Claire's, Essie, Fresh Paints, glitter, Love and Beauty, matte, Matte Me Crazy, nail polish, New York Color, NYC, OPI, pink, press sample, review, Revlon, silver, Sparkle Topcoat, Ulta | Permalink. American Eagle Outfitters Holiday Nail Set Review and Swatches! Green and Brown Water Marble! Sally Hansen Fuzzy Coat Review and Swatches! The Polish Influenza by Beth B is licensed under a Creative Commons Attribution-ShareAlike 3.0 Unported License. © 2013 by the Polish Influenza Unauthorized use and/or duplication of this material without express and written permission from The Polish Influenza is strictly prohibited. Excerpts and links may be used, provided that full and clear credit is given to Beth and The Polish Influenza with appropriate and specific direction to the original content.